Headlights on the mountain are possible at the location in the above photo and in fact its the only place where its possible to be in line with our cameras and the lights in the video and in relation to where they transpose on Mt. Bigelow as seen in MUFON's video. Anywhere else would be in dense forest. 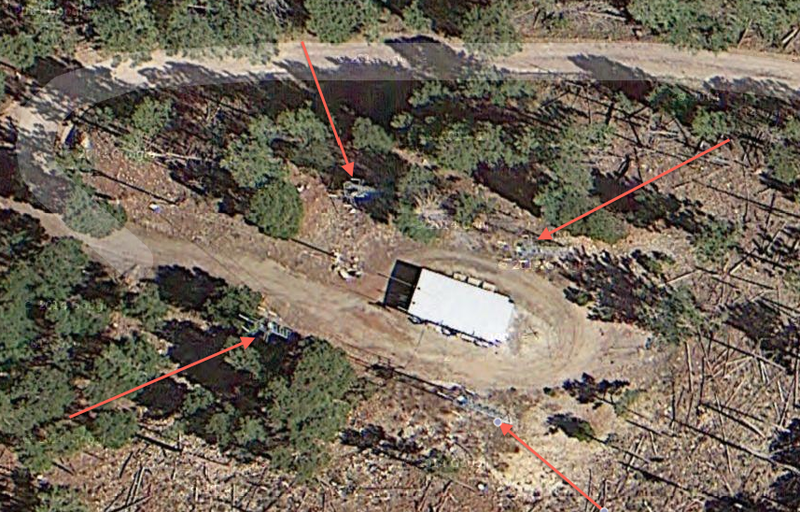 The red circle on the left is the Whitetail Campground where Dennis from MUFON interviewed the rangers who are the camp hosts. I interviewed them as well on 9/3/15 and they said there is no possible place that they were aware of that lights could line up and shine down to Tucson. On the other side of the highway is E. Whitetail Rd. that if followed as the red arrows show, ends up at the towers with the lights on them that can be seen on the right side of the screen of my video during the first couple of seconds. I drove that entire primitive dirt road all the way out to the towers and it lies in deep, dense forest all the way. 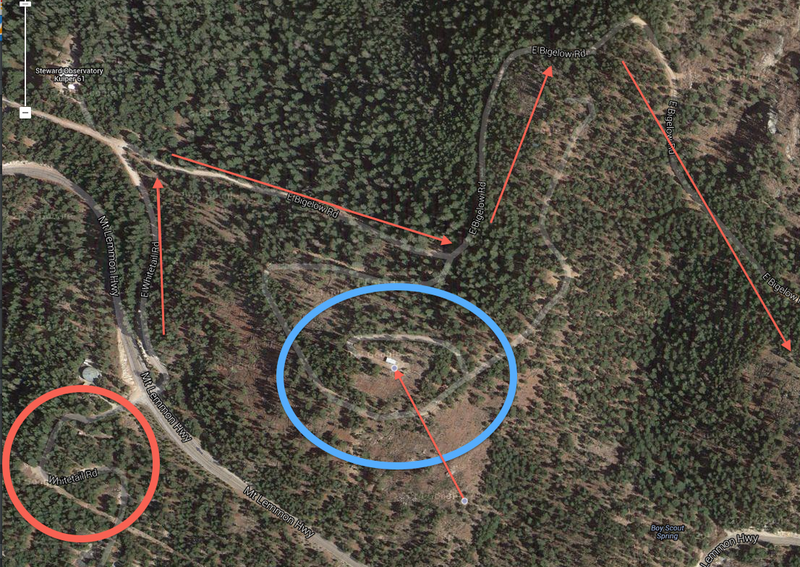 The blue circled area is where a building is that has some shorter towers that have no lights as confirmed by the ranger. This is the location where vehicles could possibly park and shine their lights down to Tucson. Above is a closeup of that building and the arrow going from left to right is of the approx. 120 feet of road that is level coming from a steep grade from farther left. The two arrows pointing up show an open area where there is visibility down to Tucson and that is approx. 40 ft. wide. Note the trees to the left that completely obscure views to the city below. To the right is a sharp drop off as well as at the edge of this 40 ft. section. The four arrows above point to the towers that are on this property. Note the two towers to the left are well into the area where trees would obscure views from the ground into Tucson. The rangers said that all locks for forestry service gates, sheds, etc. have the same key, thus any employee could have access to unlocking the entrance gate to get up to this building. Also, if the lights were motorcycles they could have gone around the gate. Here is a still from my video showing the initial 3 lights to the right and the green burst high and to the left. If people had gone up there and shone their lights down to Tucson for their buddies to see during fireworks and then they used blue and green lasers to further signal them, then one of them may have climbed up in the tower to shine one of the lasers which would be consistent with this photo. However, the 2nd set of lights that appeared as 3 lights (strange car!) 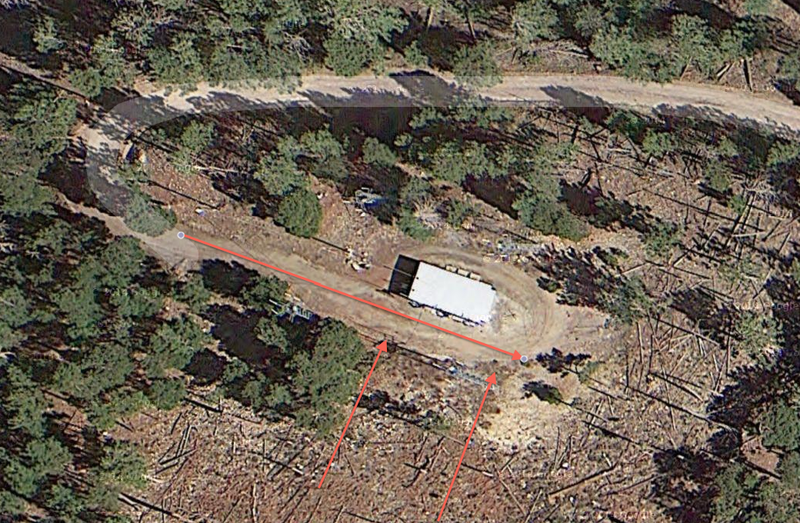 shows up to the left of where the green light has flashed and thus would have to be well behind a heavily treed area on the mountain since the towers on the left of the building have already been seen to be behind a wooded hillside. Above is MUFON's transposed photo of the lights over the missing background mountain, Mt. Bigelow. To the east (right) towards the lighted towers is a small peak with a yellow arrow pointed to it. The yellow arrow on the left is approx. where the 2nd set of lights showed up and ended just left of the original ones. The next block of text will explain more about this. The photo above will give some reference to a video that will follow. The red circle is the peak of Mt. Bigelow. The blue circle is a lesser peak to the east that works as a good reference point. By drawing a line roughly to where the video was taken, the space between that line and the building with the towers in the center of the photo is approx. 1,000 ft. The arrow on the left represents where the 2nd set of lights originated from as seen quite clearly in Gene Coleman's video and less so in mine but it still can be seen. That arrow to the right is approx. 1,000 ft. away from the building with the towers as well. Click the button below for Gene's video and go to the 4 min. mark and you can see the origination of the 2nd set of lights. It takes approx. 25 seconds for it to travel smoothly 1,000 ft. over to the left of the original lights, and slowly materialize. The 2nd button is for my video and you can barely see them to the left at about 5:07. Again, the blue arrows are approx. 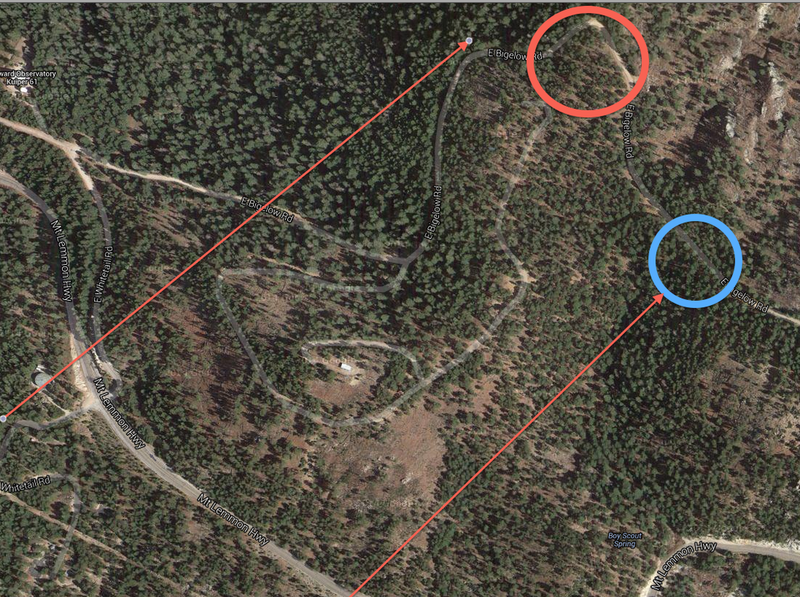 1,000 ft. in length and the purple arrow between them is the approx. 120 ft. of flat road space in front of the building with most of that obscured with trees as far as a view south. Whatever has come from the left covering 1,000 ft. of distance in just 25 seconds as shown in Gene's video with no road to travel on has suddenly appeared to the left of the tower behind a mass of trees and is yet visible on video from Sabino Canyon. This is the one major anomaly that cannot be explained at this time. These are deep, dense woods and there is not a chance of any type of vehicle going up an extremely steep slope in just 25 seconds through them plus it would be coming up from well below and thus its lights would be obscured by the forest. Click the link below for my latest video where I go through the gate and up to the building and the towers.